By now Virginia fans have digested many of the scenes that unfolded around the country Monday night as the UVA men’s basketball team secured the National Championship. Coast to coast, Hoo fans reveled in the euphoria of One Shining Moment and rejoiced for Tony Bennett and his players. Charlottesville, of course, served as the epicenter outside of Minneapolis. From the John Paul Jones Arena to The Corner to The Paramount Theater, fans collectively witnessed the drama of the title game and then celebrated the victory. Basketball fans weren’t the only ones captivated. 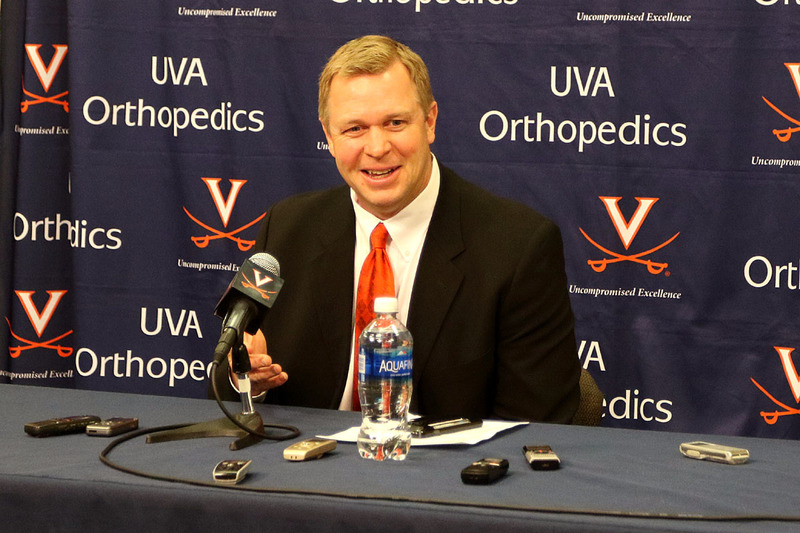 Virginia football alumni, players, and coaches rooted on the Hoos from near and far too. UVA coach Bronco Mendenhall flew to Minnesota to support the team where alumni Heath Miller, Chris Long, Tiki Barber, John Phillips, Tom Santi, and more were also in attendance. Other coaches like Marques Hagans, who said he wished he could have gone, and Cavalier players stayed glued to the TV in Charlottesville despite having a 6:30 a.m. workout waiting on the other side. Hagans said watching the Hoos win was a “surreal feeling” but exciting. The Cavaliers’ win on the Final Four stage wrapped up a strong year for the two major revenue sports at Virginia. The football team finished its season with an 8-5 record, the first winning season since 2011, and a 28-0 bowl blowout against South Carolina, the first bowl win since the 2005 Music City Bowl. The last time both teams had earned a spot in the postseason in the same sports year came in 2007-2008 with the football team in the Gator Bowl and the basketball team in the CBI (College Basketball Invitational). The last time both programs won a postseason game in the same year came in 2003-2004 with football claiming the Continental Tire Bowl trophy and basketball getting an NIT victory against George Washington. You have to go back quite a bit more to find a season where a bowl game win coincided with an NCAA Tournament win. That came in 1994-1995. The football team topped TCU 20-10 in the Independence Peach Bowl and finished No. 15 in the final rankings. The basketball team won three NCAA Tournament games to make the Elite Eight against Arkansas before falling 68-61. Virginia’s football players said you can sense the success in the air and the momentum building for the entire athletics department with demolition underway at the start of the UVA Athletics Master Plan process. Keep in mind that Virginia also won a National Championship in baseball in 2015, putting the Hoos in select company for that double with Arizona, Florida, Michigan, Ohio State, and UCLA. As the players and coaches spoke with media members on Wednesday, a large machine slowly chipped away the frame of Onesty Hall in the background. That provided tangible signs of the feeling around Grounds among the coaches and athletes. University Hall is scheduled to be torn down later this year as well. “I think that any time you see people that you know – and the way that it happened, a magical year. The way their season went. They played so well at the right time and they were so clutch. That was encouraging to see that. How sound they are. How they do it. They do it with what seems like a sound approach; I don’t know enough about baseball but I know Brian’s a great coach and it seems like they maximize their talent. … They continued to keep knocking, keep knocking, and they’ve advanced. And they didn’t lose heart this year. What an example of perseverance. You know there’s such a fine line between being really good and not being so good. They were on both sides of the line this year and then all of the sudden, boom, they took off and played at such a high level. Sitting in U.S. Bank Stadium among the orange and blue sea cheering on the Hoos, Coach Mendenhall had a chance to talk with Bennett’s former players and see the basketball team capture the championship. He also got to experience the celebration and support flowing from all corners of the Wahoo universe. In addition to Bennett’s former players, John Paul Jones, Terry Holland, Ralph Sampson, University President Jim Ryan, former University President Teresa Sullivan, John Grisham, Katie Couric, and others watched in Minneapolis. Like Bennett with baseball, it all provided Mendenhall and the football team with similar hope. Since the dramatic big victory Monday, I’ve been thinking that the basketball championship could be an inspiration and an example to the football team, which may be on the verge of a breakthrough season. Too soon to hope for any NCAA playoff chances, but a Coastal Division title is a realistic goal and would be a big accomplishment in Mendenhall’s 4th season. And maybe, just maybe, that special fellow lined up behind the center might get into the conversation about the Heisman. Maybe even get a few votes. Who knows? Anyway, this autumn should be an entertaining one.